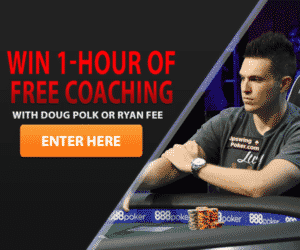 Monday was a busy day for Doug Polk. He started by joining Joe Ingram as a guest on the Poker Life Podcast, then hopped right into Day 18 of the Bankroll Challenge. It was a relatively slow day for the Twitch Stream, though it gave time for Doug to talk with the chat about diverse topics. Motives to continue with The Bankroll Challenge. The bankroll peaked for the day at $154, but dropped to $150 as the night came to a close. That’s where day 19 will pick it up. Doug decided to bring back Cash Game Fridays with some full ring NL2. He sat on two tables, one of them empty. The day started well, with Doug getting the full $1.15 of value out of a turned full house, a great change of pace from Monday’s session. Figuring that he’s been good, he decided to treat himself with a glass of Scotch “to ease the pain of the 1c/2c streets.” The scotch in question was a 15 year old Macallan Scotch Whiskey. Table action was pretty fast paced, with the bankroll jumping around during the first hour. No stress this time around, however, Doug kept up with his promise of keeping it casual. Helping his mood was the fact that he was running great, getting paid with sets, pairs and boats and managing to get away from scary boards. A few unprofitable spats with Twitch regular JohnyBlvze aside, his return to micro stakes cash game was going great. After a while, Doug started to seem bored with the NL2 games, so he decided to take a shot. He opened a single NL10 game and kept an NL2 game on the side, until a half an hour later when all the NL2 were gone. It was all good though, as his NL2 rungood had followed him all the way to NL10. After stacking John Blvze’s pocket Kings with a turned full house, he was in a demonstrably better mood than he was while grinding NL2. By the second hour, Doug announced that the Bankroll was at $161. Doug was able to give Binks the good news that he can now afford to buy him food. He also reminded his audience that his schedule now is Monday and Friday at 5 PM PST. There will likely be no stream this next Friday as Doug will be playing a high roller instead. At the 2.5 hour mark the boats started to become much less frequent and Doug was back to even on the session. Somebody in the chat asked Doug if he plays as DougPolkerWCG on ACR. That’s actually not him, just someone trying fool others into thinking they’re playing with the original WCGRider. The Bankroll was being chipped away little by little until it was down for the day at $146 by the third hour mark. From then on out, however, Doug started to slowly win it back. The winning sped up when Doug hit quads in a huge pot. Doug flops a set as a pile of chips fly into the pot. Which completes the flush draw, but gives Doug a boat. The Middle Position player shoveled the last of his chips into the pot, and remaining players called. The remaining player gets the last of his chips into the pot with a turned nut flush and Doug scoops the $30.16 pot. Doug celebrated, reassuring a terrified Binks that he indeed will be able to eat today. After a while, however, Doug seemed a bit tired. He had been streaming for almost four hours and, despite the stakes (or maybe because of them) the session hadn’t been easy on him. He checked out the ‘’damage’’ his bankroll had received during this session and was actually surprised to see that he was up for the day. Not wanting to leave #GrindNation unsatisfied, Doug stopped playing and streamed some high stakes games from the rail over at PokerStars. Despite a big downturn on the middle of it, this session ended up where we peaked off, at $161.